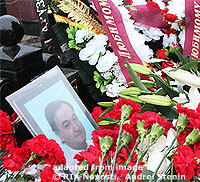 An official linked with the case of lawyer Sergei Magnitsky, who died in custody awaiting trial, has reportedly come to the attention of investigators in connection with the recent Defense Ministry’s embezzlement scandal. Investigators re-opened a case over illegal VAT recovery, dating back to 2010, when Olga Stepanova headed a Moscow tax office, Vedomosti reported on Wednesday. The case was suspended, but reopened and passed on to higher authorities, an anonymous source told the business daily. In 2011, Stepanova was appointed to a high position in Rosoboronpostavka, a governmental weapons supply agency affiliated with the Defense Ministry, but kept the job for less than a year. The case, however, has nothing to do with the previous accusations brought by Magnitsky who acted on behalf of Hermitage Capital, an investment company co-founded by Bill Browder. A representative of the Investigative Committee told Vedomosti the reason was the most recent embezzlement scandal in Defense Ministry’s affiliated Oboronservis company, which was followed by the sacking of the ministry’s head, Anatoly Serdyukov, soon after the scandal broke. “These two are linked together,” the source said. Investigators have collected a considerable amount of evidence, but no-one has been arrested so far, according to the publication. Tax reimbursement operations, worth 5.4 billion rubles and endorsed by Stepanova, were also questioned by Magnitsky, who was later accused of orchestrating fraudulent operations himself. According to Vedomosti’s sources, the estimated yearly amount of reimbursed taxes approved by Moscow’s tax office No. 28 in 2008-2010, when Stepanova was in charge, was between 4 billion and 7.5 billion rubles, a tax official told Vedomosti.